I’ve used many different hosts over the years since I launched my first affiliate site back in 1998. For years, I went with shared servers and then got to the point where I needed a dedicated server five or so years back. This past March, I thought I’d found the ideal solution with the Rackspace Cloud. I was wrong. There ended up being frequent downtimes and the sites (my blog, Affiliate Summit.com, FeedFront.com, GeekCast.fm, and others) were too important to tolerate it. 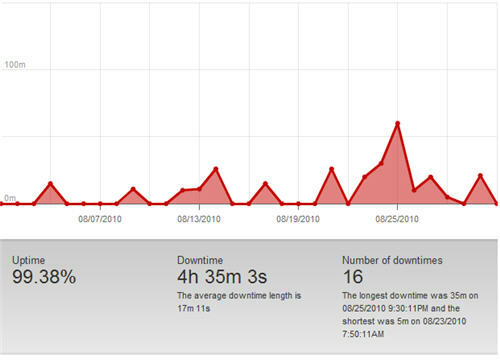 For the month of August 2010, there were 16 downtimes for a total of 4 hours, 35 minutes, and 3 seconds, according to pingdom.com. So anyway, I spoke with a large number of folks about the hosts they were using, and it turned out the majority were at Liquid Web. Based on the people using Liquid Web, I decided that was the host to investigate, and I loved what I saw. They had competitive pricing and rave reviews from friends. Also, it was nice that they performed the migration of my sites for me for free, and they did it over Labor Day weekend. I was a needy case with lots of questions during the migration, and they got back to me quickly with resolutions throughout the weekend. Granted it’s early now, but I’ve been very pleased with Liquid Web.